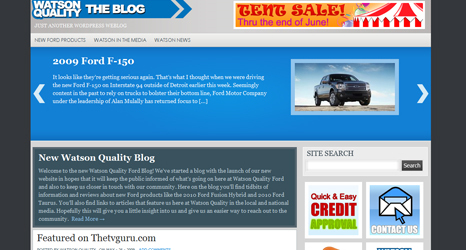 Just finished up on two new sites for the car dealership I work for. It’s a Joomla 1.5 site with a customized back-end for people here at the dealership to be able to easily log in, check traffic stats, change pages, etc. Took about 2 weeks from start to finish – procrastination included. Most of the time spent was gathering information for the vehicles (because quite frankly I didn’t know much about F-650’s and cargo vans…but I do now!) It’s got several plugins like slideshows and lightboxes for image popups. Very cool site, I am happy with it. We decided to make a blog for a few reasons. It’s cheap. It will offer us an outlet to keep the local community updated with our business, the local competition, the state of the auto industry, sales, new products from Ford, and all that sort of good stuff. It’s WordPress based so it’s easy to quickly change and edit which gives us an opportunity to quickly add and remove things like Internet Specials and coupons for service work and/or car sales during events. 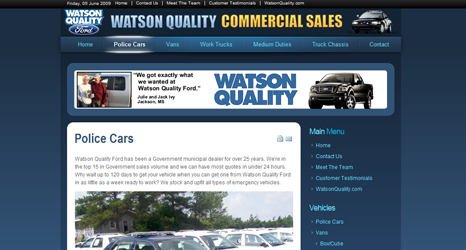 It’s got links all over it that point to our main site www.watsonquality.com that will hopefully improve our website’s relationship with google and give us a bit of a networking aspect between the three sites (main, commercial, and blog). It’s got a contact form for an easy way to get in touch with us, as well as RSS subscription possibilities. Leave me some feedback and lemme know whatcha think!